graciously signed the Royal Warrant for the Merchant Navy Medal for Meritorious Service. The first of these prestigious State Awards were presented by HRH The Princess Royal at a ceremony in Trinity House on Tuesday 15th November 2016. 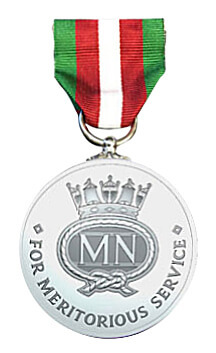 This supersedes the previous Merchant Navy Medal, details of which can be found here. 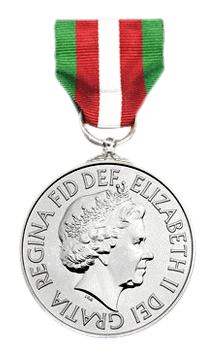 "This new state award, with a place in the order of wear, is being awarded to those who are serving or have served in the Merchant Navy and fishing fleets of the UK, Isle of Man or Channel Islands for exemplary service and devotion to duty, rewarding those who have set an outstanding example to others. Coinciding with Merchant Navy Day, it provides an opportunity to remember the sacrifices of our brave seafarers of the past and to show our appreciation for British shipping today and in the future." 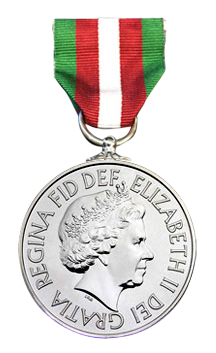 View previous recipients of the medal here. Find out more about the Merchant Navy Honours Consultative Committee patron. The Merchant Navy Honours Consultative Committee relies upon the generous support of its sponsors. Find out more about the original Merchant Navy medal. Whilst the Department for Transport is ultimately responsible for recommending awards to the Ministers it has agreed to consult closely with the Merchant Navy Honours Consultative Committee when reviewing nominations. The Merchant Navy Welfare Board, acting on behalf of the Consultative Committee, is happy to answer queries about eligibility and the nomination process.